The 33rd running of the Tour of Pendle. It’s a classic fell running race up my local hill – Pendle Hill (557m). I say ‘up’ it. Its basically up and down it five times from various sides. 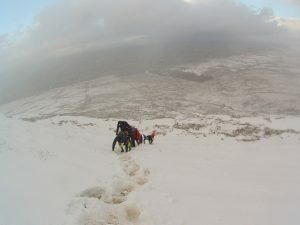 Its held in mid November and is the last AL race of the FRA (Fell Runners Association) calendar for the year. ‘AL’ is the grading of race – ‘A’ being steepest, ‘L’ being longest. It works out at 27km (16.8miles) and getting on for 1400m of climb. Part of its attraction is the fact that its a long race at a time of year where the weather can play a big part on the outcome. None more than in 2015, where the course was shortened (to a BL) due to the threat of a horrendous storm, low temps, driving torrential rain and strong winds. So with bated breath the 447 entrants on the start list I suspect were watching the forecast with a great deal of anticipation… I know I was! The forecast was for intermediate snow/sleet/rain lower down throughout the day, and although with windchill the temperature was going to be well below zero, the winds were not strong and from the one direction, meaning part of the course would be ‘chill free’. Part of me expected a shortened course… but YAY not this time! I have been ready for this race and looking forward to running it for a while now, several recent long training runs, the BG recce, three mountain marathons this year – I felt the best prepared for this race since about 2012. Bring.It.On. I had set myself the goal of sub 4 hours in the previous weeks, (my PB being 3.45), conscious the snow would have an impact, I still felt that was attainable, even if a PB was not. With multiple club mates and clubs from all over the country in attendance, the Tour is something of a marquee race in fell terms – everyone wants a good run. Most first timers just want to “finish it” (there is a cut off two hours in at Checkpoint 4). Fell runners can be judged on their “Tour time” in the same way their performance is gauged in the ‘Lakes Classics’. 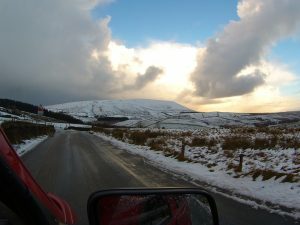 The route is enshrined in Pendle Fell running lore; club runs on the hill are described by Tour route ‘reference’ points. That route being: “From the Village (Barley) Hall, up the reservoir road to Buttock, then to the Trig (top), but don’t stop, across to the gate/ladder stile, then to the gap in the wall – Checkpoint 1, before cutting across the moor (boggy!) 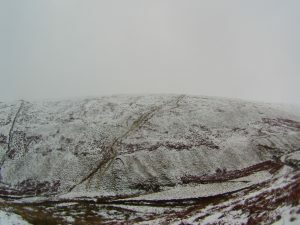 to pick up the Ogden/main track heading for Apronfull Hill and the Quarry – CP2, before an about turn down to Churn Clough Res(ervoir) and CP3, then climb up on to Spence Moor before charging down ‘Geronimo’ and on to CP4, also known as “Bill’s Stone” after the memorial there to Bill Smith. (I recommend you Google “Bill Smith Fell Runner“). This is about half way in distance terms… however the Tour’s sting is all the big climbs are on the back half of the race! From CP4, its along Ogden Valley, climb out of this and up to the main track, down Ashendean Clough to CP5, before heading up again to the Memorial Cairn (two CleM runners, who sadly died in the nineties in separate incidents, but both pursuing what they loved to do). CP6 is beyond here, cross the wall and aim for the ‘Big Dipper’ (Mearley Clough), an insanely steep descent to CP7 at a stream/wall crossing, before crossing the stream then immediately climbing straight back out an equally steep hill to ‘Scout Cairn’-CP8, (Pile of stones on the OS map). Connoisseurs of contours will enjoy looking at Mearley Clough! From CP8 its along the top ridge line, past shelter cairn, over the ladder stile and then DOWN to CP9. This is the killer blow. Its a long way down on ‘Downham side’ (a small village to the north west of Pendle HIll) and an even longer way back up – ‘the Big End’ again, to the trig, and CP10. Then its time to summon whatever you have left and charge down a long gentle hill from CP10, across Barley Moor to CP11 (same as CP4) to then join the main reservoir track back to the Village Hall. Sounds simple right? 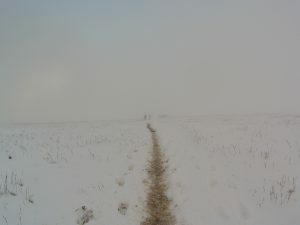 To be fair it is – even in poor visibility, there is no real navigation required, a well worn trod has been created and even in the snow – well, it was a foot deep rut in places more or less all the way round. So provided you are not in the top ten or so and leading, you just need follow that. The snow negated any local knowledge I could bring (frustrating – I have plenty) as the moment you were out of the trod, you were in enough snow to impede progress, (unless descending, in which case snow is the best thing ever!) 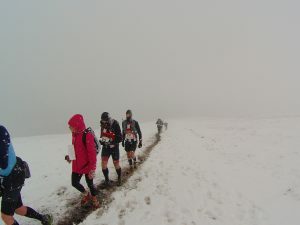 so all the little runners trods and snickets on to runnable/less technical terrain were all the same – snowbound and therefore out of bounds. 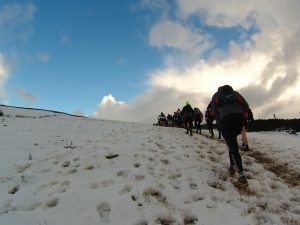 As the pictures and video clip suggest, the snow was on the ground and falling intermittently, making a really challenging race. Runners wiser and more experienced than I, all remarked “that was the toughest Tour” they could remember – after 18,20,25 odd goes at it, they should know. It was the combination of fallen snow, but unfrozen and therefore muddy tracks, with the wind, precipitation and poor visibility in places that seemed to add 20-30 minutes on to peoples expected times, the record for the Tour is 2 hours, 11 minutes. The winning time today was two hours and nearly forty minutes, so there is something in that ‘plus 20 minutes’ for the conditions. From my perspective this was my best Tour, and up there with some of my best races/runs. I felt strong, was pleased with my performance and even though the Garmin says 4.09 (results not up as write this – so no official time yet) if you take 20 minutes off, that puts me where I wanted to be before I set off. 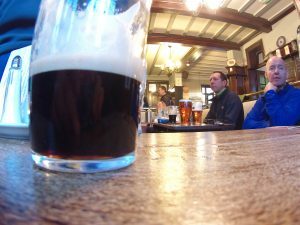 I felt as though I was passing more people than were passing me from CP1 onward and I got my food and drink right today, no flagging or bonking on the route at all. A couple of negative things stood out, concerning other competitors poor decision making, mostly kit related but here and now is not the place for that. I’ll save that rant for another day! All in all an amazing days running and one for the memory bank. I raced in 3/4 length leggings (OMM brand), Injini socks with Seal Skinz over the top, Innov-8 Mudclaw 300’s (classics – green and black), top half I started in a skinny fit long sleeve Helly Hansen base layer with CleM vest on top, but on the first climb from Buttock to the Trig when the frozen rain and wind blew in I put on my Montane Minimus smock and it stayed there for the duration. I also wore an Innov-8 peaked cap – great for protecting eyes in inclement weather. I also wore gloves -ODLO ones with a great pull over mitten feature – used plenty on this run, great for warming fingers/protecting from the wind. In my OMM bum bag was the usual FRA kit – Waterproof pants (Montane Minimus again), a compass (-Silva type 3), route map, a trail mix bag of malt loaf, jelly babies and jelly beans, two SIS Gels and about 800mls of water with ~High5 electrolyte tabs in. I can say that all the kit is well tested and trusted, but in particular today, the nutrition bit was spot on.